Let’s take a look at one of my favorite scenes from a recent horror movie, Final Destination 5. We have our young gymnast, who escaped her terrible fate at the beginning of the movie, and is now attending what appears to be a routine practice. But the audience knows that she is going to die. Everyone in this film will die. It is how the franchise works. And the way in which they build the deaths of each of their characters makes every single scene tense. Not in the presence of an 8 foot tall, hockey mask clad demon, but through the semblance of normality. You don’t know how she will die, but you know it will happen. The way they set up the scene leaves so many options open, and you are on the edge of your seat waiting for something to happen. The essence of horror movies is tension, and it can be a really difficult thing to get right in movies. 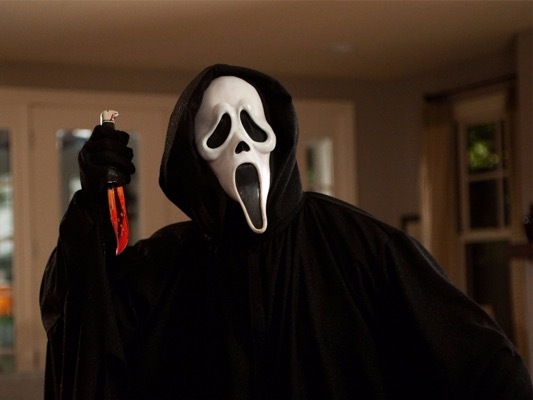 Instead of wasting it on jump scares, the filmmakers prefer to leave it present throughout each scene of the movie, as you wait to see which object kill our character. Here you have so many elements piling together that you wonder what it will be. A broken AC unit that is dripping water? A screw fallen onto the balance beam she is practicing on? Clouds of chalk dust, puddles of dripping water, a ever loosening bolt. It’s a veritable deathtrap for the young woman, and anyone remotely familiar with the franchise knows that she will die. There is a certain perverse pleasure in waiting for it to happen. Even now, after watching the scene several dozens of times, I still get anxious as her foot dances ever closer to the upturned screw, promising to bury itself in the flesh of her heel. When the action finally happens, it is over in a moment. We have no time to ponder what different decision could have been made by the girl, only watch the Rube Goldberg machine of death crank into action. A cloud of dust, a blowing fan. A second later, she lies dead on the floor, her body contorted into an awful shape as blood pools around her and bones jut through her flesh. They try something very similar in the Saw franchise. The difference here is that there is no question about the mechanisms of the death of the cast, only if they will be able to make the undoubtably impossible decision to escape it. It’s set up that as bystanders we can question whether we would go through with the awful requirements to escape. Instead of Rube Goldberg-esque fatal coincidences, you have steampunk torture traps and machines waiting to exercise their excessive gory duty on the gore and blood bags that we care so little about. The tension here comes from a slightly different place. We wonder if people can escape and we also want to see exactly how mangled their bodies will get. When you compare this to the style of Final Destination, you’ll notice a slight difference. In Final Destination, the mechanism and time of death is unknown and tension comes from waiting for them. In Saw, the mechanism and time of death is starkly evident from the beginning of the scene. The real attraction here is in how horrific it will be. It’s why a lot of horror movie fans looked down upon most of the films later in the franchise. The tension was lost in exchange for gore, and the kills lost their intrigue. Both of these styles are in response to the more traditional horror movie in which tension is built around wondering where the monster will come from next. When they will show up in a mirror behind a character, and exactly how they will kill the teenager after their jumpscare. When you really dig into what this means, the differences between them is small. In Final Destination, the killer is fate instead of a giant monster, but the effect this has on the feel of the movie is great. It changes it from a “scary” movie to a “tense” movie. The difference between a “scary” movie and a “tense” movie is as such. All horror movies, of any part of the genre rely on tension to help drive the plot and keep the audience guessing. A “scary” movie obviously wants to scare you. To make you wonder what goes bump in the night, and it relies on building this tension to a breaking point until a reaction. Hence your jump scares, and your final confrontations. But a “tense” movie follows a slightly different path. They don’t want to scare you, they want to make you uncomfortable, to keep you on the edge of your seat waiting for the next scene. A “scary” movie has you dreading the next scene, while a “tense” movie has you waiting for it. This comes into play in what makes a horror movie kill great. It needs to follow the basic set of storytelling points. You need a rising action, the tension that is built around waiting for a character to die. You’ll see what leads them to this point, and why them dying is awful. You need a climax, with your ingenious kill that brings these emotions to a head, and you need a falling action, where you allow other characters to react. Each part of this is important. If you don’t set up a character, then the audience won’t care if they die. It’s the failing of many horror movies that thrust too many characters into the plot, and we quickly stop caring once the bodies hit the floor. The kill itself needs to be something that triggers a response. Maybe it’s shock and surprise at the ingenious way that they died. Maybe it’s horror at the violence of it. Maybe it’s relief that it finally happened. But it needs to evoke a reaction. The falling action is just as important. By allowing the characters time to react, we can learn that it was important to other characters, giving them room for growth, but more importantly, it can give the audience time to breath. Allow us to process what just happened. It’s easy to go overkill (haha) with the pace of the kills, and again, they quickly lose their meaning. Violence is the reason we watch terrible horror movies, and it is what can complete an excellent horror movie. We are enamored with it, as our screens are pained red with gallons of fake blood and torn limbs. A bad horror movie can be saved through the creative disposal of it’s cast, and a great one can be improved by the effective use of a villain’s malice. We discount them as too violent every year, but they still grab us and force us to watch more.